2. Download the SteamCMD (Windows) Update Tool. You will see the SteamCMD.exe, Double click for it to execute. This will download more files and then leave you with a black command line window. This is the actual server executable and you can change what type of CSGO Server starts, Max Players, Maps, and more by using different parameters. For a Full list check our Config Tab. Login to rcon to use rcon commands. stat Find out players IP information. status List current player names, time played, and steamIDs within game server. Kick player using their name. kick number Kick player using their number. You can find their number by type the STATUS command. banid x playernumber Ban player for x amount of minutes using player number. listip List all ban users by IP. listid List all ban users by ID. removeip # Removes IP from banned list. Replace # with ip. removeid # Removes ID from banned list. Replace # with id. sv_restart # Restart the game. Both player scores and money go back to default. Replace # with a value up to 10.
sv_restartround # Restart the current round. Replace # with value up to 10.
sv_gravity # Changes the gravity on map. Default is 800.
mp_forcechasecam # When dead, you may force the player to only view his teammates in first person or allow them to roam freely. Replace # with 1 to enforce cam view or 0 to disable it. mp_roundlimit # Replace # with the amount of rounds before map is changed. mp_roundtime # Replace # with a time value in minutes to determine when round ends. mp_timelimit # Replace # with time value in minutes to determine when map should change. mp_friendlyfire # Replace # with 1 to enforce friendly fire or 0 to disable it. mp_startmoney # Replace # with the amount of start money. Default is 800. The highest is 16000. Server will keep logs. Use 0, the default, to log no attacks, 1 to log enemy attacks, 2 to log teammate attacks, and 3 to log both. mp_playerid# Controls what players when aiming crosshair at opponent, a hostage, or a teammate. Set to 0 (default), the player see’s all popups with team colors. Set 1, the player sees their teammates and hostages, with team colors. Set 2, players see no popups. mp_fadetoblack # When player is dead his monitor will turn black, preventing user to see gameplay. 1 to enable, 0 to disable. mp_buytime # When new round starts, this determines how many seconds a player has to buy weapons. The minimum value is 0.25 and there is no maximum. mp_winlimit # When a team reaches a set amount of wins before the timelimit or the roundlimit is reached, it has won the map and will change map. 1 to enable, 0 to disable. Forces players to join teams to keep them balanced. 1 to enable, 0 to disable. Once C4 is planted, this determines the amount of time it takes to explode. Replace # to ranges between 15 and 90 seconds. Allows the use of flashlights. 1 to enable, 0 to disable. mp_footsteps # Allows footstep sounds. 1 to enable, 0 to disable. mp_freezetime # Freeze time before round begins. Gives time for players to buy weapons. Default is 6 seconds. mp_hostagepenalty # Sets the amount of hostages a player can kill before they are kicked from server. mp_limitteams # Sets the amount a team can have extra players before the server autobalances. Default is 2. 0 to disable. mp_logmessages # Allows logging of chat message. 1 to enable, 0 to disable. This allows non-player spectators to watch or idle within the server. 1 to enable, 0 to disable. 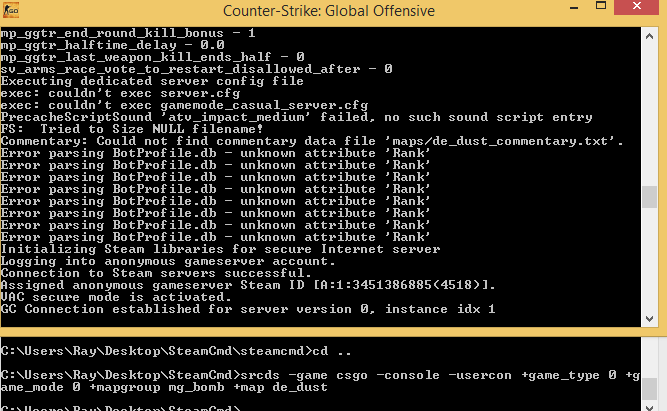 And add more games server setup guides like Counter-Strike 1.6 & Mods of games . P.S : I can help you in mods setup guide. That is a good Idea! Thank you. Yes i would love to help you in making new article and stuff , tell me where i should contact you . Gameservers.com offers CS:GO server hosting at excellent prices. They have datacenters worldwide and rank as the best GSP for gamers.